Núvellen is quite an all-rounder! Bloggers and writers can present their content in a clean and user-friendly way. No clutter or distractions will draw a visitors attention away from it. Artists and photographers will have a blast utilizing the themes portfolio and gallery functionality. You can freely decide how you want to present your artworks and photos – from 1 to 8 columns, with or without a title bar or excerpt, letting visitors see your work in a lightbox gallery or on a dedicated page. 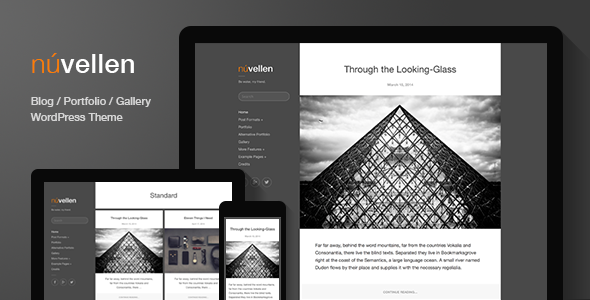 Item Reviewed: Núvellen Blog Portfolio WordPress Theme 9 out of 10 based on 10 ratings. 9 user reviews.